Join us for one of our upcoming (or more if you wish) Block of the Months. Come enjoy fellowship with others, chat, make new friends and some beautiful quilts! We offer two kinds of Blocks of the Month. Drive Through or Dine In! Our “Drive Through” is always held on the third Tuesday of each month at 6pm. At this meeting you will have short instruction from the teacher and show and tell. For this program you will take your blocks home to sew and return the next month for show and tell and to receive the next months block. There is an optional sit-n-sew with the teachers until 9pm. So bring your machine and supplies to sew after! Our “Dine In” will be held on various dates and times in a more typical classroom setting with hands on direction with the teacher where you will be learning and constructing your quilt top will be learning and constructing your quilt top. Simple yet stunning! FanFaire, designed by Krista Moser, is a colorful quilt. Every block teaches you a new way to use the Creative Grids 60 Degree Diamond Ruler, designed by Krista Moser. Cut a combination of diamonds, triangles, hexagons, parallelograms and trapezoids to create this fun quilt, and all with one ruler! This quilt goes together fast and is oh so striking! 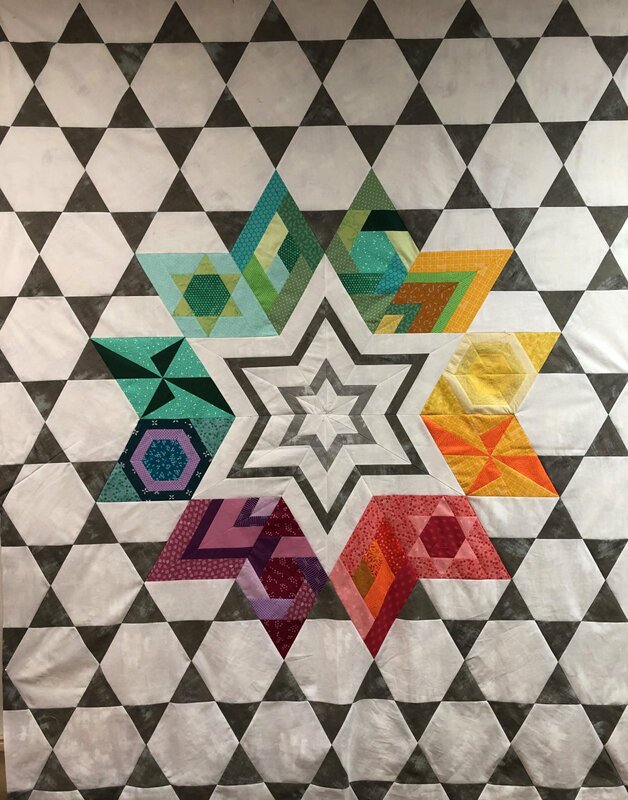 During this 7 month block of the month program starting February 19th, you will receive the pattern, 60 degree ruler, some fun extras to assist you with the project, and all the fabrics needed to make our version of this amazing quilt top. The finished quilt measures 66" x 79". Registration: $29.99 non-refundable registration fee, Kit fee: just $32.99 per month. Kit’s are limited so sign up early. 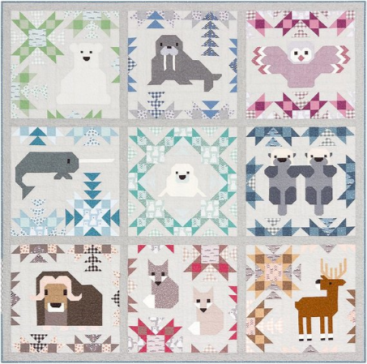 Recreate The North Stars Animal Sampler Quilt which features 9 blocks, each 24" x 24", Patty Polar Bear, Willa Walrus, Owen the Owl, Neville Narwhal, Lucille the Seal, Olive & Oswald Otter, Meredith Muskox, Fritz & Fred Fox, and Reggie Reindeer using the Arctic fabric collection and all of the Essex yarn-dyed and Kona cotton coordinates. All blocks are sewn with simple straight and diagonal seams. No templates or paper piecing! Because the blocks are all the same size, they can be mixed and matched to make endless combinations. Each month of this 10 month block of the month program starting February 19th 2019, you will stitch a new animal. 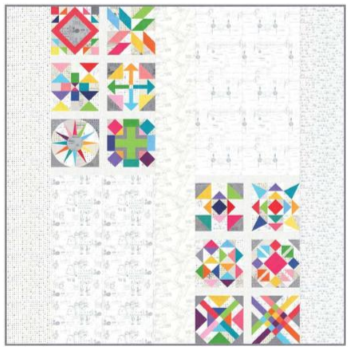 With this block of the month you will receive the 44 page full color pattern booklet, some fun helpful items to assist you with the project, and all the fabrics needed to make this amazing quilt top and binding. The finished quilt measures 82” x 82".Registration: $29.99 non-refundable registration fee, Kit Fee: just $34.99 per month for 10 months. Kits are limited. Sign up early! 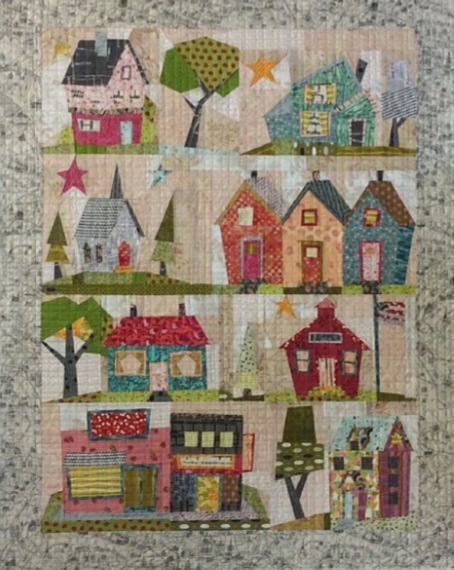 Join us for My Kinda Town a paper pieced scrappy quilt features 9 whimsical paper pieced blocks in a quaint town setting! Join us for 9 months to make this adorable scrappy quilt. During this 9 month block of the program, you will receive the pattern, and all the fabrics needed to make our version of this amazing quilt top. The finished quilt measures 42" x 54". Registration: $29.99 non-refundable, kit fee: just $32.99 per month, which includes pattern, fun extras, and fabric to make the quilt top. The fabrics will not be the same as the store sample. We will stay within the color way of our store sample. It’s meant to be scrappy. You can borrow from other months fabric kits and include some of your own fabric to make it your own. Join us for our Spotted Block of the Month, with the gorgeous pattern and fabrics of Zen Chic's Brigitte Heitland. Fabrics are from the collections "Spotted" and "Modern Backgrounds More Paper". Spotted More has 12 bold, colorful blocks - one for each month. The gray and cream backgrounds are full of interesting textures and graphics. You’ll use a variety of techniques like traditional piecing, fussy cutting, applique, paper piecing, and more. During this 12 month block of the month program starting February 19th, you will receive the pattern, some fun extras to assist you with the project, and all the fabrics needed to make this stunning modern quilt top. Quilt finishes at 85" x 85". Registration: $29.99 non-refundable, Kit fee: just $29.99 per month. Kits are limited, sign up now!